The Chrysler Diablo is one of the purest expressions of Virgil Exner’s talent that exists today. 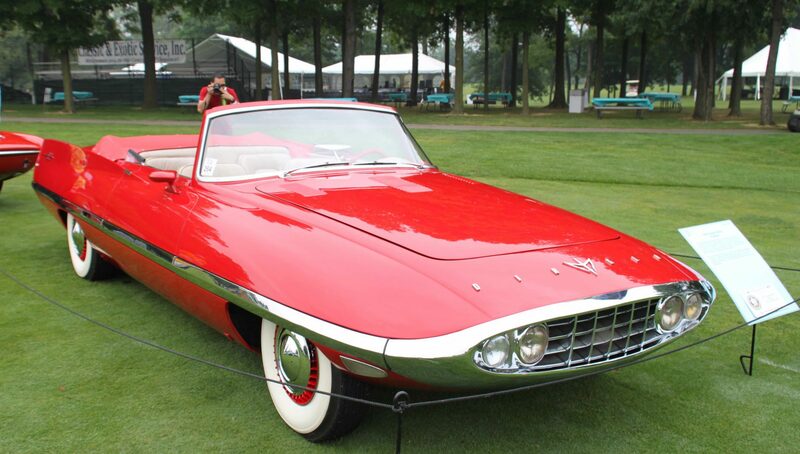 It began life as the “Dart” concept car, crafted by the artisans at Carrozzeria Ghia in Italy. Built on a 1956 Chrysler 300 chassis, it had a sizeable 129” wheelbase, and was altered in Detroit in 1957 and renamed the “Dart II”. It was finally returned to Ghia for comprehensive modifications, renamed the Diablo, and used extensively on the International Auto Show Circuit. We photographed it at the Concours of America at St. Johns in July of 2014. The Italian craftsmen executed the striking vision of Exner beautifully, with elegant lines that were inspired by jet planes and rocket ships. The Diablo’s Manta-Ray face, oval hood, and muted fins gave it the lowest coefficient of drag ever recorded for an automobile at the time. Powered by it’s original 392 ci Hemi V-8, it pumps out 375 horsepower and is every bit as muscular as it is beautiful. It was displayed at the Concours by Linda and Paul Gould. If you have a early model Chrysler or another collectible you’d like to insure with us, let us show you how we are more than just another collector vehicle insurance company. We want to protect your passion! Click below for an online quote, or give us a call at 800.678.5173.